When I first heard of the portable, disposable grill called ‘Rumba Grill’ it immediately peaked my interest, for someone who does a lot of hiking, camping and cooking, a disposable grill could mean the difference between eating a ham and cheese sandwich or a grilled chicken breast with vegetables. Anyone who has spent time camping with only the bare essentials understands the true value of a hot tasty meal at the end of the day. When I first came across only what I had heard described to me as a disposable grill, I had found the EZ Grill and assumed that this was what people were referring to as the Rumba Grill. I assumed they had given the EZ Grill a cool Spanish nickname as Rumba refers to a party, the party grill! I wanted to try these disposable grills first hand so I bought 2 of the EZ Grills. They were small and light, taking up minimal space in my car or backpack. The packaging says “lights with one match!” and “lasts for 1.5 hours” and I wanted to put it to the test! We were camping at Lake Bayano in Eastern Panama, I had marinated some chicken to cook for dinner. When opening the EZ Grill package I was reminded that you only needed 1 match to light the grill, so I searched the car for my matches and took out only 1 match, almost hoping it would not light and disproving the claims of the EZ Grill. The grill was immediately lit with one match after applying the flame to the starter sheet, the flames were evenly spread across all of the coals without any hassle. We were able to cook all of the chicken I had prepared for that night and the grill continued burning and putting off heat long after we had finished cooking. The second EZ Grill I had bought we used on the balcony of my friend’s apartment and again it worked just as before, perfect and above my expectations. As with many things in Panama, products come and go, what is here one day will be gone and never to be found again by the very next day. I was looking everywhere for more of these disposable grills, looking to buy a few more to keep on hand for camping trips or beach days. I even had my friends looking for them as well. I then came across a big stack of these disposable grills at a local grocery store, except this time they were called the Rumba Grill, the packaging was similar so I thought maybe they had changed the name from EZ Grill to Rumba Grill since that is what everyone seemed to be calling them anyway. I even took a picture of them to send to my friends so they too could be on the look out for these grills. We put two of these Rumba grills to the test, not knowing they were different companies, different grills. I still believed that they were the same company and just changed the packaging. I could not have been more wrong or more disappointed. Most recently my friend and I went to use the Rumba Grill on the balcony of his apartment again, when I arrived he mentioned he could not get the grill lit. Since I like to think of myself as a very competent fire starter and grill master I immediately went outside to remedy the situation and on the way was handed a box of long wood matches. Without exaggeration, I literally spent more than 30 minutes and probably 50 matches trying to get the starter paper and coals lit before finally giving up. I am not one to easily give up, especially when starting a grill and cooking on it but this was a lost cause. Luckily we had a spare EZ Grill and were able to eat that night! The next night I soaked the Rumba Grill with lighter fluid and even though it ignited without issues (as would just about anything with lighter fluid on it) once the flames went out and the grill cooled, there were still many coals left that never ignited or burned. I am not certain who brings the EZ Grills into Panama, but I hope you continue to bring a lot more of them! As for the Rumba Grill, I will not waste any more of my time or money. EZ Grill for the win! Rumba Grill pictured on the left; you can see at least 7 or 8 matches we tried to use to light the grill. 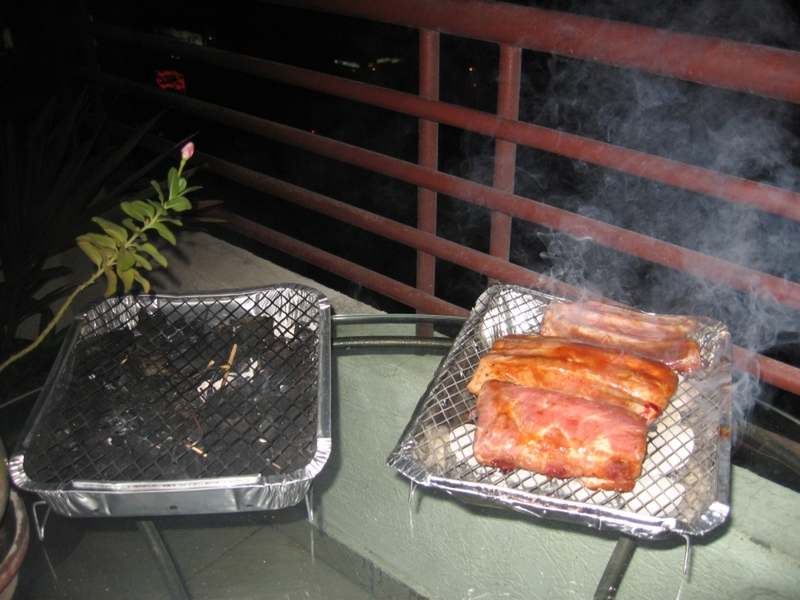 The EZ Grill pictured on the right; hot, smoking and cooking some thick pork ribs. « Why is the rum gone? !